Operating HPLC, UPLC, Particle Size Determination, FTIR, Dissolution Testing, Assay, CU, RS, KF Titrator, UV Spectrophotometer, pH meter, GC, TDS, COD, Learning more things, Precision, Time Management. I am ASHISH JAYANT SATPUTE, student of Technical & Analytical Chemistry. I have already completed B.Sc. (Chemistry.) from University of Mumbai and Post Graduate Advanced Diploma in Technical & Analytical Chemistry from M.S.B.T.E.,Mumbai,India. The goal of my life is to direct my career towards Production / Quality Control / Quality Assurance / Technical & Analytical Chemistry. I have started my career with multinational company SUN PHARMA PVT. LTD., as Trainee Analyst. 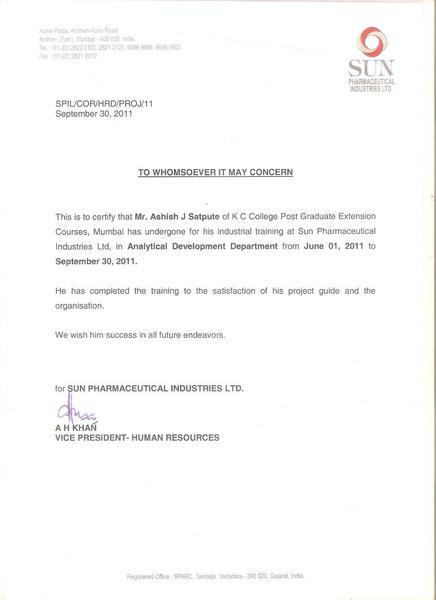 After the completion of my training I have to prepare project on Industrial Training and accordingly I prepared the same based on my Industrial Training experience in SUN PHARMA PVT. LTD. I am Beginner. I have been pursued Post Graduation Diploma in Technical & Analytical Chemistry, Passed with 69.75% in 1st Semister and 82.25% in 2nd Semister, with 4 months of training in R&D Dept. of Sun Pharma Pvt. Ltd.. currently, I am working with Deepak Novaochem Tech. Ltd., In Q.C. Department. Playing Chess, Theater Act, Writing, Watching Movies.